RADAR Nudge enables secure, fast teamwork among clinicians and administrators. No matter where each colleague is located, issues that can be addressed instantly are handled instantly. No need for a backlog of post-its and voicemails—all the open loops that require follow up. 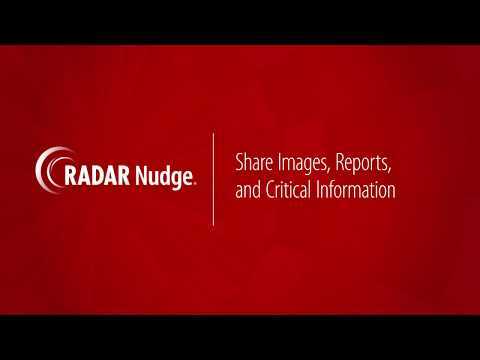 RADAR Nudge transmits secure, encrypted information instantly among connected users. Healthcare providers can now securely share and collaborate on any clinical or business issue. Clinicians can send and respond, with messages grouped by conversation to further ensure secure patient information. Nudge delivers HIPAA-compliant communication, so all regulatory requirements are addressed with no hassle. Clinicians can share robust content, such as key images, clinical notes and links to collaborate more effectively. Nudge is tightly integrated with eRAD RIS, for one-click, seamless messaging—and attachments—directly from the system with no workflow disruptions. Any organization can deploy Nudge immediately. No elaborate training, expensive equipment, or drawn-out system overhaul is required. Nudge is available for Windows users, and as an app on iOS and Android mobile devices. Schedule a demo and see how you can put RADAR Nudge to work.